Many people have heard of a “galvanized” metal nail, or a group of people “galvanized” to action by some inciting event. 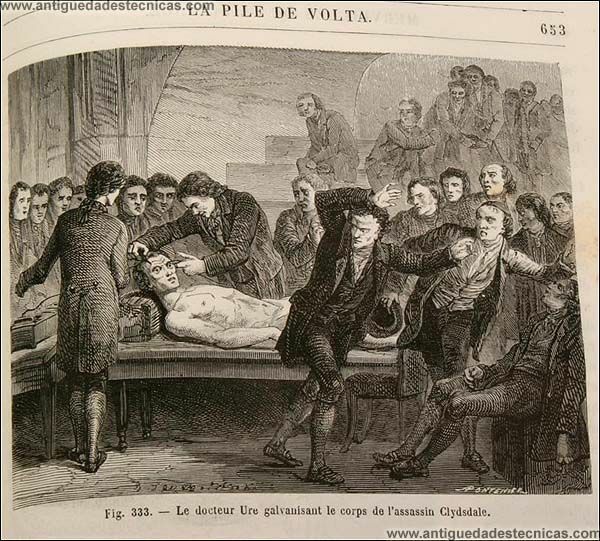 While skinning a frog in his laboratory one day, Galvani accidentally touched a nerve in the frog’s leg with a metal scalpel that happened to be charged with static electricity. The scalpel sparked. The frog’s leg twitched as if suddenly brought to life. Galvani plunged into a lifelong obsession with bioelectricity. He thought that a fluid form of electricity was carried by nerves to muscles. But his research was cut short due to a political upheaval at his university. Galvani’s nephew, Giovanni Aldini, took up his uncle’s experiments and brought his findings to the public. In a macabre demonstration in London in 1802, Aldini used powerful batteries to wire up the heads and decapitated carcasses of cows, horses, dogs and sheep. Attendees reported seeing a decapitated cow wired at the stump of its neck kicking its legs and flopping on the operating theater table. The disembodied heads of dogs and horses opened their eyes. Their jaws chewed at the air. In January the next year, he got permission to experiment on the body of a hanged criminal, George Forster. Forster was convicted of killing his wife and children, though there are rumors his confession was given under duress. Aldini even pulled strings to speed up the man’s prosecution and execution, to make sure the body was as fresh as possible. Aldini also inserted an electrified rod into the cavity of the body, which caused Forster’s cadaver kick and punch wildly. The illusion that Forster had been brought back to life was so convincing that people in the crowd shouting for the condemned man’s corpse to be hanged again. The incident likely inspired the notable work of Marry Shelley, and could have played a role in that strange infamous case of two rogue medical students* that were debarred from our own Medical School by Dean Halsey some years ago. * One Herbert West and an unnamed confessor; the investigation is ongoing.